Highly Formulated with a mixture of specially formulated Nitrifying Bacteria. Establishes a healthy growth of indigenous Bacteria in biological filters. Uniquely formulated to condition fish coats and reduce aquatic stress. Provides a proper balance of unique conditions to establish physical vigor and vitality. Pond Builder Bacteria Starters unique indigenous bacteria has the ability to eat nutrients that can cause pond problems (algae and green water). 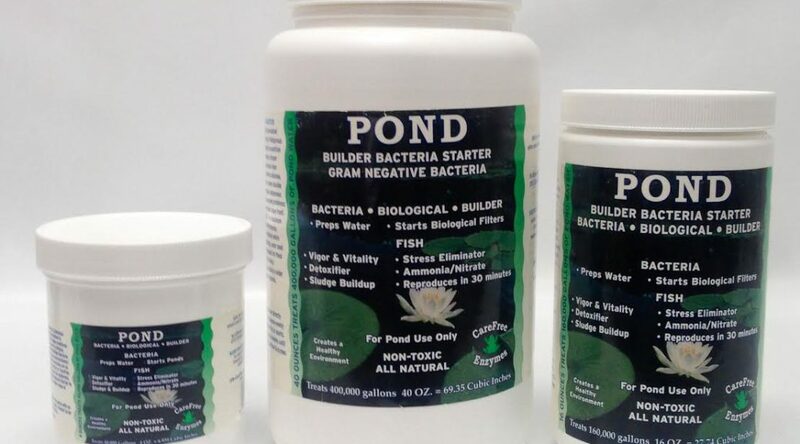 However, Bacteria cannot eat algae by itself this is where enzymes are so very important, use CareFree Enzymes Pond Protector or CareFree Enzymes Pond Protector Concentrate which contain natural enzymes that open the epidermis, outer shell of microscopic, cellulose and organic contaminants for Pond Builder Bacteria Starter to absorb effectively. Provides 5 different strains allowing it to assimilate a wider range of organic contaminants common in ponds. Add one scoop per 10,000 gallons of pond water directly into biological filter. For ponds with no filter disperse evenly around entire pond, Over dosing will not affect fish or plants. Product to be used in water 45oF and higher. Add weekly until water gains clarity. Use in conjunction with CareFree Pond Protector or CareFree Pond Protector Concentrate.